Free Shipping Included! 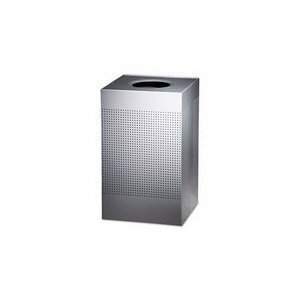 Rubbermaid Commercial Silhouette Designer Wastebasket, Square Open Top, 40-Gallon, Stainless Steel (FGSC18SSRB) by Rubbermaid Commercial Products at In The National Interest. MPN: FGSC18SSRB. Hurry! Limited time offer. Offer valid only while supplies last. Makes waste collection more efficient. Save time, reduce worker strain, and lower labor costs. Trash can's slim shape fits efficiently into spaces. Makes waste collection more efficient. Save time, reduce worker strain, and lower labor costs. Trash can's slim shape fits efficiently into spaces. Ideal size for use at desk side and behind bar counters. Venting channels dramatically reduce the force required to remove a full can liner up to 60% when compared to traditional Slim Jim containers. 4 molded-in can liner cinches improve liner retention and save time during waste collection by eliminating the need to tie knots in can liners. Molded base grips offer better control during emptying. Molded-in drag rim on the bottom of the container provides addeddurability. Sleek lid options improve functionality while maintaining the slim profile. Made in the USA. Rubbermaid Commercial FG354100LGRAY Slim Jim Trash Can, , 15 1/2-gallon with Handles, Gray. Perforated heavy-gauge steel receptacle is fire safe. Stainless steel finish is durable and resists corrosion and rust.